To say the Panthers have a need at tackle is something of an understatement at this point. As things stand right now, they have a left tackle who’s played just one game there in his career – which didn’t exactly go great – a right tackle on a prove-it deal coming off a season-ending injury and a #3 tackle yet to put on a jersey through four seasons. In short, it would be more of a shock if the Panthers didn’t tackle a tackle in the first couple of days of the draft than if they did, and it is a position they could sensibly target as early as with the 16th pick. There are likely going to be some questions after you’ve read my big board – I have some different opinions than a lot of other scouts – so I’d encourage you to have a listen to the latest episode of The Great British Drafting Show, where we go in-depth into my rankings and why exactly I don’t like Jonah Williams and prefer Greg Little. 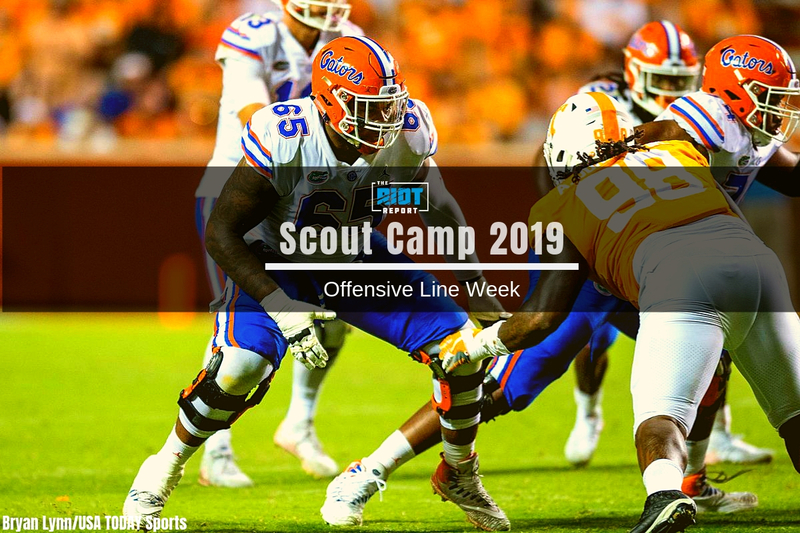 It’s not only tackles that the Panthers need, so check out my guard and center big board while you’re here – and then let’s look at the tackles. I’ve already gone in-depth on Little, Andre Dillard and Williams, three tackles who are consistently associated with the Panthers and the 16th pick, but what does the rest of the 2019 tackle class look like? Tackle is an interesting position to evaluate, as the skills required to be successful are often interlinked, leading to a large range of flaws being created by one or two underlying issues. While people will point to athletic characteristics such as power and foot speed – and don’t get me wrong, they are important – by themselves, they have little value if they aren’t used in combination with other skills. In terms of foot speed, players need to be able to show this in combination with a wide base and good knee bend, thereby lowering their center of gravity and making them harder to drive backwards with a bull rush. In addition to this, they also need to show a fairly even weight distribution between their front and back legs; if they load weight onto their back legs as many tackles are prone to do, this can force them to raise their pad level and also increases their lateral momentum, making it harder to react to inside moves. In terms of power, they need to combine this with good knee bend, a wide base and good balance, as if they get too high or lean forward too much, they risk either getting jacked up or side-swiped, thereby negating any power advantage they might have. Hand usage is, of course, also very important, with players ideally keeping their elbows inside their frame and using their hands independently to keep defenders away from their frame with the ability to strike accurately and quickly to the frame of the defender when they are within reach. This is also relevant when they are asked to play in space, where they not only need to show the requisite movement skills but also the ability to locate defenders. As always, these evaluations don’t take into account injury history or off-field concerns.